Editors: Zimring, Carl A. and Rathje, William L.
Archaeologists and anthropologists have long studied artifacts of refuse from the distant past as a portal into ancient civilizations, but examining what we throw away today tells a story in real time and becomes an important and useful tool for academic study. Trash is studied by behavioral scientists who use data comÂ­piled from the exploration of dumpsters to better understand our modern society and culture. Why does the average American household send 470 pounds of uneaten food to the garbage can on an annual basis? How do different societies around the world cope with their garbage in these troubled environmental times? How does our trash give insight into our attitudes about gender, class, religion, and art? 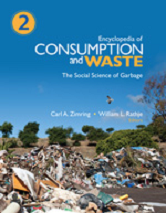 The Encyclopedia of Consumption and Waste explores the topic across multiple disciplines within the social sciences and ranges further to include business, consumerism, environmentalism, and marketing to comprise an outstanding reference for academic and public libraries.